Top Spanish brands put their best foot forward at Modacalzado in Madrid from March 17 to 19, 2009, where there was chance to see their autumn/winter 09/10 collections. Hot trends include the classic Oxford shoe, updated with feminine detail like coloured leather and heels. Leggy cowboy boots and giddy platforms also head the list of things to come. Chie Mihara has gone for texture mixes. References from the 1980s like metallic materials and bright colours live alongside a profusely decorated 19th century look, and even a Russian folk style, with fur-lined boots. Nothing is left to chance in this range, and even when colours are neutral, detail is infinite. Sara Navarro has gone for a first in footwear: smell. The designer has included floral fragrances on soles – like gardenia, cherry and orange blossom – for added appeal. Jewelled sandals and bridal designs have been elaborately crafted into what are almost collectors’ items. Pura López will have you oozing with sophisticated femininity as on the designer has created ultra-high platforms in three-coloured suede for next winter. Studs add a rocker look to ankle boots and salon shoes sport caterpillar soles in a collection that includes eye-catching wallets and handbags. The designer also offers bridal equivalents, which turn away from convention in favour of the latest trends. Rebeca Sanver goes for jewelled platforms and shoes trimmed with chains, stones and pearls. Metallic details appear as studs or little steel spots on brogues. Patent leather – a previous favourite – makes room for warmer looks such as fur. Magrit focuses on jewelled shoes with feathers, stones, sequins and organza flowers. Animal print is also in, especially zebra stripes and leopard spots. Pons Quintana has chosen boots and wedges as its mainstays this season, in infinite combinations and with varied details including fringes, visible seams and laces. Design and quality combine with practicality in models with non-slip soles. Fun and originality are the watchwords at Ras and Alima with silk-screen printing, sequins and knitted trim or paisley embroidery. Diverse fabric and colour feature in these designs, as in the imitation leopard skin and original plaiting used on some of the platforms. The Sacha London collection has two distinct lines. Lady-like heels sport bows, pearls, buckles or rhinestone details, while a more casual look with thick soles offers a combination of comfort and fashion. Neutral, discreet colours with rich detail is the key to the latest Sinela collection. Leather in irregular shades with curled trim make a romantic option. Looky, Unisa and Platino have gone for a more understated look in salon shoes and classic boots. Alternatives to the more traditional options were also on show. Gioseppo has gone for wellies in bright colours for winter after its success at international shows GDS and MICAM. Its children’s versions with their practical handles to help put them on caused a storm among visitors to the stand, who also took a liking to the Disney characters the brand presented at the latest FIMI. Victoria offered multi-coloured graphics alongside its signature canvas designs, where it has also introduced interesting variations, like a boot-shoe and new materials. Tartan, velvet, plasticised quilting and brocade are all evidence of an unbridled capacity for innovation. Vienty went for British and rocker touches as well as a Gaucho style that has proved a hit in Italy. The brand has upped the quality of its leather and finish to strengthen its market position. Versatility was on offer at Wonders and Lodi, where trends, colours and finish provide options for every occasion. Mustang has gone for the platform in all its different versions, from lightweight cork to other more casual styles in rope and wood. Flat sandals come in neutral shades, like earth and sandy brown, alongside fabric bags and sneakers. Like many others, Xti has gone without patent leather this time round, in favour of leather in earthy shades, blue, black and mauve, which features on flat ankle boots and bags to match. At this edition of Modacalzado the spotlight was on innovation in materials and production processes to make maximum comfort compatible with design. Pikolinos , a case in point, presented a Scotchgard treatment to repel water. Tough, easy-wear soles also gain ground over dizzy high heels, and the discreet and versatile is preferred to the bright and garish. "Total comfort" was the Fluchos slogan in a cutting-edge approach to all its designs, which are hand sewn and sport shock-absorbing sole systems. 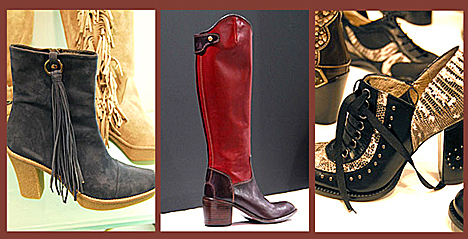 For women, it offers classic salon shoes and buckled, laced or buttoned boots. 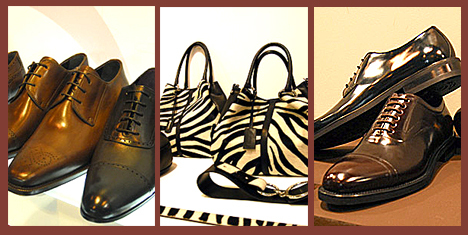 For men, there are two distinct styles: a more formal line in Oxford shoes and a casual range with decorative seams. Callaghan also presented a technical novelty at the show. Total Adaptaction is an upgrade of Adaptaction which adapts to fit the foot as well as the walker’s gait. A rear “power cushion” absorbs impact as the wearer walks, achieving maximum comfort. Both Callaghan and Miss Callaghan designs draw on 1970s-style sports shoes, using aged-look leather and retro silhouettes. British and punk styles also feature. Its children’s brand Gorila updates a school shoe look to fit new trends and offers boots inspired by aqua clothing, and coquettish bar shoes. Calzados Cienta and Andanines added a further note of colour to round off the children’s shoe section. Hispanitas has also combined comfort with design, while keeping its trademark raised toe on virtually all designs. Draped leather and an aged look strengthen the vintage look it is known for. Cowboy-style boots had a good showing, with brands like Joe Sánchez continuing to innovate, though always with top quality leather. Sancho Boots offered leather boots alongside a biker style that was all the rage. New Rock also goes for cowboy and bikers styles, with metallic trim and detail that becomes particularly original in a spiked stud version. Sendra updates cowboy boots with colours such as blue, green and coral, and uses unusual fabric combinations on the same boot, mixing python with suede or even fur. The Oxford shoe fever continues. Martinelli remains elegant and understated, keeping colours discreet and leathers premium. Zampiere also goes for this classic men’s style, updated with delicate design features like a subtly narrowed toe and the use of ususual materials such as Prince of Wales check and aged-look leather. Design is immaculate and craftsmanship at its most skilful. Barrats has looked to update its classic style with glossy and even iridescent leather. Suede is a hot favourite in its more traditional, British-style women’s shoes. Its Ecofield line uses water-resistant suede in a comfort-designed shape. Magnanni has also gone for tradition, updated with bright colour and aged-look leather. Moccasins, buckled shoes and the Oxford classic are its chosen mainstays. Pertini has taken classic footwear up a peg with its aged leather, asymmetrical brogues and pointed toes. Its men’s collection uses bright colours, unusual in winter, for a dynamic up to date look. Regular exhibitor Drap Barcelona added a touch of glamour and fantasy with its party footwear and accessories: strass, guipure, organza and python make for unusual mixes in its creations, with clutch bags a hot favourite. Menbur also offered a party line with matching shoes and bags, as well as a complete bridal footwear range. Puntotres took a practical quality approach to bags and wallets. The next Modacalzado takes place in Madrid from 24th till 26th of September2009.